For airlines, one of the biggest barriers to innovation is a lack of control over their most valuable, soft asset - the offer. Decades ago, airlines abdicated much of their control over flights, inventory, and pricing to the PSS, GDS, and other third-party providers. When new capabilities or fixes were required, band-aid after band-aid was generally applied until systems were trussed up by restrictive, innovation-stifling complexity. Easily improve the way they package, price, present, and optimize their offer through various channels. Make the most of the latest data-driven retailing strategies such as dynamic pricing or prescriptive analytics. Experiment and discover better, differentiated ways of serving the customer need. Next-generation air commerce technology engines can turn this situation around, providing an escape route for beleaguered airlines. Airlines can now benefit from lightning fast – and independent – merchandising, shopping, pricing, availability calculation, and dynamic connection building. When combined with open APIs (such as IATA NDC) these next generation engines put full offer management directly into the hands of the airline – in many cases without calling the PSS, distributing through the GDS, or even filing fares with ATPCO. Breaking legacy technology relationships can be tough. Legacy players are fighting to remain relevant and onerous contracts and heavy-handed negotiation has become par for the course. Untangling years of technology investment is a daunting prospect, that involves much soul-searching by stakeholders across the organization. It’s sometimes realistic to bear unnecessary legacy cost, because the revenue returns of implementing new-generation technology can easily make up for these gross financial and technological inefficiencies. This situation is about to change as a powerful trend is about to make its mark – goal convergence. It’s widely recognized that departmental silos within the airline organization are breaking down – although probably not fast enough for those looking to drive change. Distribution, revenue management, and marketing are beginning to work more closely together to maximize the value of the airline’s most valuable soft asset. 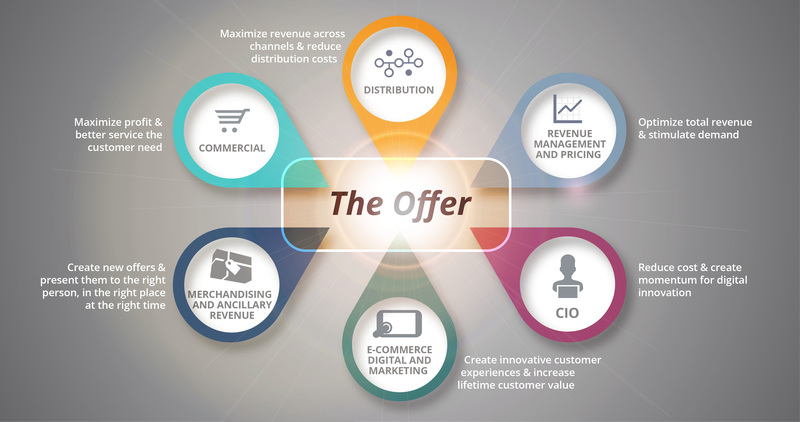 With collective goals converging, there is now a robust business case for end-to-end offer transformation (refer image below). Any one of these goals identified in this image would warrant an investment in offer transformation. Now as goals are converging, we are at a watershed moment that will make wholesale offer transformation a reality. Offer transformation is the theme of FLX-Disrupt 2018, the airline industry’s only event dedicated to innovating airline distribution, revenue management, and commerce, through new generation technologies and strategies. Taking place in Miami, April 24 – 26, FLX-Disrupt 2018 is a complimentary event open to airline executives. The agenda will challenge delegates to rethink decades of legacy processes, embrace offer transformation, and realize the power of airline-controlled (NDC) distribution. For more information and to request your invitation to FLX Disrupt 2018 click the button below.